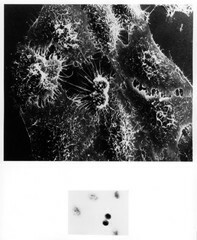 A scanning electron micrograph of cultured HeLa cells originally derived many years ago from a woman's cancerous cervical tissue. A light micrograph (x130) of the same cells (inset) reveals rounded double cells in the center in the process of dividing. This HeLa cell (named after patient Henrietta Lacks) has been infected with adenovirus. After 4-1/2 hours the HeLa cell's surface becomes rough. The multiple surface blebs on this cell characteristic for a certain stage of cell division that both normal and cancer cells go through. Research with the SEM has established the extraordinarily responsive nature of cell surface form. This instrument records, in pictures, specific cell reactions to various changes in the cells environment and maps the distribution of surface binding sites for biologically important molecules such as hormone, antigens, and pharmacologic agents.